Are you an avid gamer? Do you play High-end games on your PC? Or Are you a person who does a lot of tasks on your PC? If yes, then I am sure your PC generates a lot of heats. And you are looking for the solution. 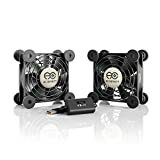 I hope you already know that you need the best case fans to decrease the temperature while doing multiple tasks or playing games. But the problem is it’s not easy to buy the best fans. There are many case fans available in the market. I know it’s not easy to select the perfect one. Some peoples want RGB case fans, some peoples want quite case fans. Different peoples have different choices. That’s why in this post I have listed the top 10 best case fans out of 79+ case fans. I have also written a complete buyer guide for help you to find out the best case fan according to your needs. 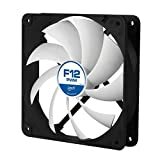 Here are the reviews of best 120mm case fans and 140mm case fans in 2019. All fans are available in different sizes. Most common sizes are 120mm and 140mm. In this reviews, I will be talking about 120mm and 140mm computer case fans. Before buying a case fans you should check your case size. Read this guide to measure fan size. When it comes to buying a case fan, Corsair is the best and most popular brand. The main reason I love this it is a magnetic levitation bearing fans. The magnetic levitation bearing fans has no friction because of the fans shaft’s and the bearing doesn’t touch. As a result, you will get lower noise, longer life span, high airflow. As I said there is no friction present, the fan is faster and has a better performance too. The air flow is also amazing in this fan. You will get anywhere between 12 to 75 CFM without any trouble. That makes it an excellent choice for a case fan. It would do well in the front casing as well, provided it has some space in front of it. The product has a 2400 RPM top speed. Now enjoy everything from lower noise to best cooling performance. However, the fan does get quite noisy at the top speed. They can cool down the CPU even with extended gaming. Again a Corsair product has made a place in the list, in its own performance of course. It is one of the most contemporary and stylish products on the list. If you are looking for Dual Light Loop RGB LED PWM Fan then Corsair LL series LL120 is for you. This fan has 16 RGB LED in every fan. The speed of the fan ranges from 600-1500 RPM. The RPM value works efficiently well to cool down the CPU. However, there are case fans out there in the market which have higher RPM values than the Corsair LL Series LL120. So, keep that in mind when making a decision. Noctua has presented the market with their own case fans via their NF-F12 PWM cooling fan. The product has a unique design that has been made to achieve the perfect balance between performance and sound level. There are anti-vibration pads installed on the fan. They are made of silicone. These pads ensure less vibration. That, in turn, protects the fan from damage. The Noctua NF-F12 PWM cooling fan has an SSO bearing. The bearing allows the fan to be more durability, precision, and stabilization. It has a maximum RPM value of 1500. It does the job quite of cooling down the PC quite well. However, there are fans out there with higher RPM values that you can get. Next, we are going to talk about the Thermaltake Luna Series LED case fan. They are probably the most stylish case fans out there for you. The unique feature of the case fan is the anti-vibration mounting system. Now, what this system does is it fits the fan into its place firmly. Also, it also decreases the vibration. It has a 50 CFM air flow to get the job done. Add to it the enlarged frame, and you will see that it sure does it well. 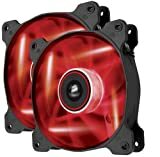 The Thermaltake Luna Series LED has a self-lubricating hydraulics bearing. It ensures the fan stays in function for years to come. The single thing I had a problem with this fan is the sound level. Yes, you guessed it right, they are noisy. This is a serious disadvantage for many of the users. Corsair makes some amazing case fans. You probably have realized that by now seeing so many Corsair products on the list. Their Air Series AF120 LED is one such product as well. These fans come in a wide range of different LED lights. White, purple, red, you name it, they got it. So, if you want to touch an add of vibrancy and style to your computer, this one is definitely for you. The AF120 has an air flow of 52.19 CFM. It does the work perfectly well. However, there are fans out there in the market that offer higher CFMs than this one. The Static Pressure is 0.75 mm/H2O in this product. The static pressure, although not the very best, is not bad either. It is suitable for almost all the basic work. It has a 1500 RPM of top speed. Now, this is again, not bad at all. But you can find higher RPMs in case fans out there in the market. The fan produces 25.2 dB noise at its top speed. It is not that much noisy, adding to its benefits. You can work without having distractions with this fan by your side. Another Corsair product in the list. It is getting a bit predictable, I know, but they deserve the spot. The Air Series SP120 is arguably the most powerful case fan on the list. The air flow is a huge 62.74 CFM. The powerful airflow cools down your PC in a matter of moments and keeps it running for extended hours. The Corsair Air Series SP120 has a static pressure of 3.1 mm/ H2O. It is a very high static pressure. The fan can do its job way more efficiently and faster than many other fans because of these powerful features. A 2350 RPM of top speed can keep your PC cool for longer hours. Go on playing those extra hours without worrying about overheating. The one downside of the Corsair Air Series Sp120 is its noise. It has a sound level of 35 dB at its highest speed. It is quite loud. However, considering the powerful features, it is somewhat expected. Now, you can also check out the Rosewill 120 mm Long Life Sleeve case fan. It is certainly a product worth your money. To make things better, it comes with a lower price tag. As you might have guessed from the name, these fans come with sleeve bearings. Sleeve bearings have two lubricated surfaces sliding against each other. The fan has an air flow of 38.2 CFM. This does the job decent enough. However, there are many fans that have a better CFM value than this one, although it is not that bad when you consider the price point. The Rosewill 120 mm Long Life Sleeve has a top speed of 2000 RPM. It is a pretty high RPM for any case fan. Therefore, it can circulate more air at any given time than many of the other case fans on the market. It cools down your PC relatively faster than many other case fans. The noise level is a disadvantage in this fan. They are quite loud. However, if you are someone who wears noise-canceling headphones most of the time, it should not give you any trouble. Another player of the field, Cooler Master, has the JetFlo 120 R4- JFDP- 20PB- R1 under their sleeve. These fans are perfect for you if you want a smaller computer case because of their ultra-thin design. They take up only a minimal space, that leaves you plenty of free space for the other components. The CFM value of the fan is up to 95, which is really great. It pushes sufficient amount of air inside your CPU to make it cooler with no visible trouble. The Cooler Master JetFlo has an RPM range from 800 up to 2000. This can definitely be called high-performance. With this fan by your side, you would not have a trouble playing for those extra hours. The problem with this fan is its noise level. It is a bit noisier, and that can cause serious discomfort for many. The sound level reaches up to 36 dB which is pretty high. However, you can fix the RPM into lower values. This, in turn, would lower the noise. ARCTIC has presented us with a budget-friendly case fan, the F12 PWM Rev.2. Now, do not be fooled by the low price tag, it does its job essentially well. The unique feature of the fan is the PWM function. It lets the motherboard to run the fan exactly at the speed that is required. As a result, you get the best cooling possible without wasting more energy than necessary. Furthermore, the air flow is 53 CFM which is pretty good to handle the everyday work. Play those long hours of your favorite game, let the fan worry about cooling down your PC. The RPM range is from 500 to 1350. It effortlessly cools down your CPU. However, there are many more fans out there that has higher RPM values than this one. You might want to take that into consideration before making a final decision. The fluid design makes sure your fan lasts you for years without any hassles on your part. Another Thermaltake product that made its way into the list is the RIING CL- F047- PL12RE- A. They come as a package of two. A unique feature of the product is the Concentrated Compression Blades. These blades optimize air flow direction. That results in the best airflow you can ever dream of getting. Furthermore, talking about the air flow, the air flow of this case fan is up to 51.1 CFM. These fans run quietly as a mouse with their highest sound level being 24.6 dB. You will never get distracted while working or playing games if you have these case fans on your CPU. There is an anti-vibration mounting system. It allows a snug fit and also reduces vibration of the fan while running. It’s a well-known fact that when we get angry, we tend to lose self-control, we make stupid decisions, and we create wounds that are difficult to amend. Well, a computer acts similarly. When hot, it may underperform, throttle, and may well ruin your day. That’s where a Case Fan will help you to cool down the system and get it back on track. Most of the PCs have pre-fitted fans, but they are not the best in the business. For the best performance, you will have to buy an aftermarket case fan. Fans come in different sizes, different varieties, shapes, design and different specifications. You will have to be careful to choose the best one for your PC. No need to panic. We have you covered. This case fans buying guide will help you to select the good case fan as per your requirements. Being the smallest amongst the most commonly used sizes, it produces less air and is the cheapest amongst the commonly used lot. It also has the knack of producing the most noise. It is suitable for your PC if your system generally doesn’t get too hot. It still produces very good airflow considering it’s size. If you are looking for a model of this category, you may want to look more for a durable product instead of its quietness and its added accessories. If you normally switch off your PC and it’s used only when required, then you can opt for this type without any further questions. It’s an excellent option for systems with low processing power. This type of case fans are bigger than the 80mm ones mentioned above and naturally, produces more airflow. They are equipped with larger blades, but their size somewhat restricts the airflow. It also tends to spin slower than the 80mm case fans, and it can move almost the same air as compared to the smaller fan given its slowness. It also tends to produce less noise while in operation, which makes it a better choice. They have received stardom very recently. They have larger blades than the normal ones, and hence they can operate slowly without even affecting the airflow. This adds to its longevity and reduced noise levels. You will find some of them with mounting holes spaced in an exactly similar way like that of 120mm, which means that if you have enough space, you may well use a 140mm one instead of the 120mm model. These, being the largest ones are also the quietest of the lot and is naturally capable of producing more airflow than the rest of the above-mentioned categories. In size it’s big, it requires a lot of power to operate, and they feature large blades to reduce operating noise and improve airflow. It provides the best cooling when compared to the other categories, and they mostly are equipped with the 3-speed manual switch that can help us to find the right balance. It is the costliest and tends to have the highest lifespan. 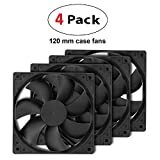 Does Case Fans size matter? The size of the case fan determines a lot of its characteristics, and it’s extremely important to find one that suits the level of performance your computer has. As aforementioned, the size of the fan determines the amount of air it can generate. Further, the size of the fan determines the amount of cooling your system is capable of generating. You can prioritize the cooling factor of the case fans and hence buy a fan which is bigger and produces the highest level of cooling. You may well consider the noise your fan produces. Here also, the biggest one has an advantage over the others, but in the current market scenario, the smaller ones produce noise that is not unmanageable and can be dealt with. What is the good case fan size? It’s pretty clear now that the biggest fan size wins the battle quite comfortably. It has the lowest level of operating noise, last the longest and produces the most airflow, but it’s also the costliest and needs the most space. But the fan you need to buy depends on the specifications of your PC, and hence the case fan size can be a relative term. One of the things you should look for is Static Pressure. It essentially stands for the pressure in which the fan circulates air through a small space. As a general rule of thumb, fans with higher static pressure are better for heat sinks and cooling radiators. Also, they are also very good as chassis fans. You can place them in front of the cases as well. High static pressure helps you to cool the CPU efficiently. The blades of these fans are made in such a way that there are lesser gaps in between them. Air Flow represents the amount of air moving through an opening. It is another aspect that you should look for when making a decision. The air flow of a fan is measured in Cubic Feet per Minute (CFM). Fans with higher air flow are best suited to be used for case fans. They perform at their highest level when there is a certain amount of space in front of them. However, make sure not to mount them in front of cases or on the radiator. You can distinguish them from static pressure optimized fans only by looking at their blades. Higher air flow fans have blades that have larger gaps between them. A fan’s speed is measured in RPM (revolutions per minute), and it’s one of the main contributors to the performance of the fan. Faster fans will always generate more airflow but may also the highest operating noise. Whereas a slow fan will create less noise but also less airflow. As always, a balance between the two is the need of the hour. You will get better performance and consume lesser power if you find the right fan. A large fan which operates at lower RPM is a great choice since it will generate enough airflow and will save energy at the same time. Air flow of a fan is measured in CFM(cubic feet per minute). It determines the level of air the fan can fill up in a minute. The better the CFM, the more powerful the fan is since it generates the highest level of airflow. RPM also affects CFM, and your choice should be a proper balance of both which may help you to maintain a respectable level of noise while not taking a hit on the performance. The noise of a fan is computed in dBa(decibels), and generally, a fan has a noise level ranging from 10 dBa to 36 dBa. And the preferred one is the fan with the lowest dBa. You will mostly find that the manufacturer will provide you with the level of noise of his fan. Mostly used in small toys, they use liquid-based lubrication to reduce friction, and they are mostly for one-time use. They are very affordable and should last around 40k hours(at 60C) while being continually used before you may require a replacement. They have a low operating noise since the fan speed is low and are mounted vertically in any axial orientation. Such fans can suffer from immediate breakdowns without any warning and are highly volatile. They have a longer lifespan than sleeve bearings, and they should last up to 60k to 75k hours (at 60C) of continuous usage and are louder than them. They have a higher temperature tolerance than sleeve bearings. They too can be mounted in any axial orientation. They are mostly used in Server-farm environments and are not recommended for home usage. They have the lowest noise levels because they use the fluid cycling technology. They have a lifespan ranging from 100k to 300k hours depending on the selected fan. They are very quiet throughout their lifespan and can be mounted without any issues. 4-Pins fans can be software controlled while the other lack this facility. Fans with MOLEX connectors can be connected hassle free if you have its cable. Rarely they need an adapter. Fans, like most other electronic items, are prone to dust over time. Dust collection can result in higher noise levels and reduced RPM. If not cleared timely, it may eventually lead to complete failure. Fan filters are used to prevent and minimize this problem. They don’t affect airflow and can be set up to prevent dust to flow towards the fan. They need to be regularly cleaned as the dirt keeps on piling on them. Furthermore, you should also check the speed of the fan. Case fan speed is represented by RPM or Revolutions per Minute. In a broad sense, the higher the RPM value, the more air it can gather. However, the performance of the fan also depends on various other factors such as static pressure and airflow. The RPM has a direct relationship with the fan’s noise level as well. Another important factor to consider is the sound level of the fan. You should be able to check the fan’s sound level in the package itself. They are measured in decibels (dB). In general, these fans range from 10 dB to 36 dB. Now, it is suggested, as you might expect, to get the fan that produces the lowest amount of noise. If the sound is louder, then it will create distractions, and your work will be hampered. 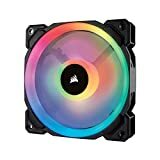 I hope you can now quickly decide to buy a case fans available on the market. 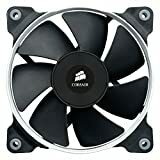 If you are looking for the overall case fans, then I would suggest Corsair ML120 Pro. I love the blue model. These are the top 10 case fans out there on the market as of right now. Good list but you should include the all info for each item ie. Cfm, noise level, price, etc. Thanks for your suggestion. I will add. But, I can’t add price.